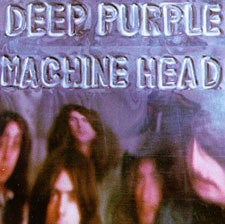 Machine Head is the sixth studio album released by English rock band Deep Purple. It was recorded through December 1971 in Montreux, Switzerland, and released in March 1972. Machine Head is often cited as influential in the development of the heavy metal music genre. It is Deep Purple's most successful recording, topping the charts in several countries following its release. The album reached #1 in the UK, where it stayed for 20 weeks in the top-40. It also reached #7 in the US, remaining on the Billboard 200 for 118 weeks.